Arriving at dusk, we’re greeted by wood fires and champagne by torchlight around a petal-filled pool. It’s easy to feel special at the Kasbah Tamadot. Perched on the lower slopes of the High Atlas Mountains, the buzz and lights of Marrakech are just specks on the horizon and you can totally switch off from modern living. The Kasbah Tamadot is one of the super-luxe properties in Richard Branson’s Virgin Limited portfolio, which also includes Necker Island, a ski lodge in Verbier, Ulusaba game reserve and a safari camp in Kenya. From the private Berber tented suites (complete with colonial-style binoculars, sun hats and handmade leather slippers) to the gloriously gluttonous in-room dining (breakfast tagine, anyone? Four course lunch? Oh, go on then…), we are spoilt rotten. Branson’s Moroccan retreat has just 27 bedrooms, which means that every guest is greeted by name wherever they go by the 120 strong staff – all employed from the local area. Should guests tire of a life of luxury (we don’t, for the record, but exert ourselves in the name of journalistic endeavour) there are also tennis courts, two pools, a gorgeous garden and a menagerie of mules, donkeys and camels to entertain. At the end of the day, we soak in the generous two-man roll-top bath and gaze out over the mountains, G&T in hand. Reveling in the heady combination of modern luxury and traditional culture, we agree that Kasbah Tamadot is the perfect antidote to the stresses of life in London – and just we need to prepare us for the next stage of our journey. Rested up and ready to explore, we wave a sad goodbye to our Berber tent and head down the mountains and away from the countryside into town. More specifically, to the madness and mayhem of Marrakech and to the Riad that is to be our home for the next two nights. 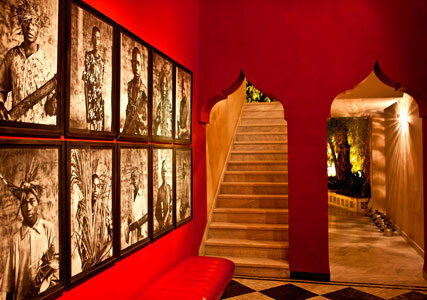 Richard Branson’s sister, Vanessa, owns Riad El Fenn in the heart of Marrakech. She first bought the house in 2002 with the idea of creating a space that had all the comfort and luxuries of a modern hotel but with the laid-back feel of a riad town house. Over the years, she bought up adjoining houses and connected them with secret passages and doorways. The result is a cool rabbit warren of courtyards, balconies and terraces, with interesting design touches at every turn. There’s an impressive contemporary art collection, including pieces by Bridget Riley and Antony Gormley – not that any of the guests here seem to take any notice of it. If the clientele at Kasbah Tamadot was old school, the hipsters at Riad El Fenn are effortlessly, enviously cool. Feeling as though we need to drop a couple of stone and get an asymmetrical haircut, pronto, we’re shown to our room. Though calling it a ‘room’ is like calling the souk ‘a bit busy’. The place is vast. Bigger than our entire flat back home and split across three levels with a mezzanine, a private roof terrace and a plunge pool. Everything has Vanessa’s creative flair running through it – from the leather-tiled floors to the tadelakt open bath and the sheet metal bathroom surfaces. It’s like the love child of Grand Designs and Wallpaper magazine and husband is in heaven. Bags dropped, we head for the souk. The labyrinth of sellers and tourists and motorbikes whizzing through narrow alleyways of Marrakech’s vast market square is not for the faint hearted. We get lost. A lot. But once we’ve bartered a bit and managed to purchase a leather bag that has no conceivable use (other than to remind us what terrible hagglers we are), we feel a great sense of achievement – we’ve made it out! In one piece! We retreat to Riad El Fenn for a traditional Moroccan hamam. This is nothing like the Turkish hamam (in case you were wondering). For anyone expecting a gentle soap down (like me) there is shock in store. As the second bucket of icy water is flung at me, I’m not entirely sure I’m a fan, but after a serious scrubbing and an invigorating massage, I feel, suddenly, very alive. The souk sloughed off, we felt ready to take on the next challenge of the day: dinner (it’s a hard life). Dining at Riad El Fenn is a delight for all the senses. We sample Morrocan dishes with a modern twist washed down with an impressive local wine list. Whilst complimenting Hafid, the head chef, we’re persuaded to join him on a trip to the market in the morning. Far from the tourist hub, we find ourselves in a fragrant covered market, brimming with herbs and spices and the vegetables we need to make an authentic Moroccan tagine. Hafid guides us through what we need and it’s then that I realise he’s expecting us to actually make this for lunch. After some protestations that my repertoire doesn’t usually extend much beyond spag bol, he assures me that ‘everything will be fine!’ and we select our cuts of meat. The lamb doesn’t quite have a woolly tail still on it but it’s not far off, and as a bag of live bunnies is thrown down beside us for the next customer I make a mental note to warn vegetarian friends planning a trip. Ingredients purchased, we are guided, step my step, to making our very own tagine. From layering the vegetables to simmering the meat and allowing the terracotta pot to infuse the flavours, this is an art form and one that I’ll certainly be trying at home. A couple of hours later (a tagine is not for the impatient) and we get to taste our handiwork. Though we say so ourselves, it is delicious. We are converts – to tagine, to Riads and to Morocco. 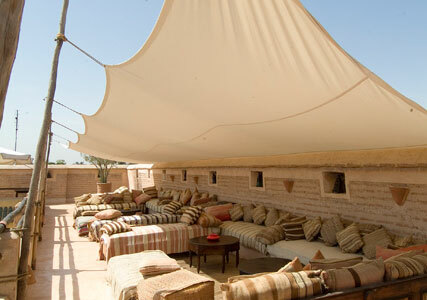 Helen stayed at the Kasbah Tamadot and the Riad El Fenn. 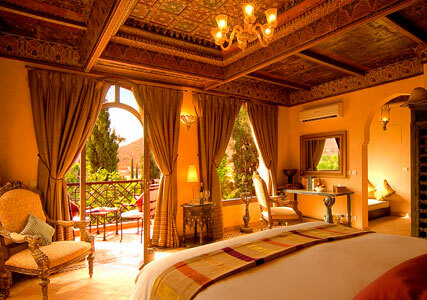 At the Kasbah Tamadot, prices start from £337 per room in low season, visit www.kasbahtamadot.virgin.com for details. At Riad El Fenn, prices start from £220 per room in low season, visit www.riadelfenn.com for details.